Let the Six Degrees of Kevin Bacon Guilt by Association Game played by the obvious blog army cubicle dwellers begin. US Attorney Jeff Taylor was sweating on August 6, as he laid out his case against the late Dr. Bruce Ivins at a news conference-and with good reason. Anyone familiar with the case is well aware that Dr. Ivins was railroaded, and that the news conference was a flimsy web of lies. Ivins had nothing to do with the 2001 anthrax attacks. The attacks were almost certainly carried out by the only group that had the means to produce the highly weaponized anthrax in the letters: the CIA, its contractor Battelle Memorial Institute of West Jefferson, Ohio., and the Army at Dugway in Utah. The DOJ-FBI frame-up of Ivins rests heavily upon the claim of new advances in genetic testing which supposedly prove that the killer anthrax could have come only from Ivins’ flask. The FBI sought out the best experts in the scientific community and, over time, four highly sensitive and specific tests were developed that were capable of detecting the unique qualities of the anthrax used in the 2001 attacks. The distinguishing feature of the anthrax that killed five people in 2001 is not related to its genes. What made that anthrax unique was that it was highly weaponized. Anthrax is a common pathogen found in the soil in many places. It doesn’t become lethal unless produced in such a way that it behaves like a gas, floating easily in the air and deep into a victim’s lungs. The anthrax used in the attacks was beyond cutting edge. Donald A. Henderson, former assistant secretary for the Office of Public Health Preparedness at the Department of Health and Human Services, told Science magazine: “It just didn’t have to be that good” to be lethal. 1. Precisely sized particles-1.5 to 5 microns. Anything smaller is exhaled, anything larger tends to get caught either in the nose or in the cilia in the trachea. 2. Coated with silica. The silica acted as a buffer, preventing spores from adhering to one another. The silica on the attack anthrax rested on a thin layer of polymerized glass, which is a highly advanced technique for coating anthrax spores. To do this required a “spray dryer,” the cheapest of which sells for $50,000. The lyophilizer in Ivins’ lab is used to dry anthrax, but can NOT be used to coat the spores with silica. Ivins did not have a spray dryer. 3. Highly concentrated. The letter to Senator Daschle’s office contained two grams of anthrax, about the weight of a dime. Each gram contained a trillion pure spores of anthrax, or enough to kill 200 million people. 4. Electro-statically charged. The slight charge on each spore caused it to repel the other spores and spread out into the room after the envelope was opened. It is these attributes of the anthrax-not its genetic heritage-which made it so unique and so lethal. For nearly a decade, U.S. Army scientists at Dugway Proving Ground in Utah have made small quantities of weapons-grade anthrax that is virtually identical to the powdery spores used in the mail attacks that have killed five people. Dugway’s production of weapons-grade anthrax, which has never before been publicly revealed, is apparently the first by the U.S. government since President Richard M. Nixon ordered the U.S. offensive biowarfare program closed in 1969. An Army biological and chemical warfare facility in Utah has been quietly developing a virulent, weapons-grade formulation of anthrax spores since at least 1992. These projects involve the CIA, Battelle Memorial Laboratories in West Jefferson, Ohio, and the Army at Dugway in Utah. Had the treaty been strengthened, the Dugway and West Jefferson sites would have been subject to international inspections. It is important to note that Battelle not only operates its own labs in West Jefferson, but also is contracted by the Army to operate the labs at Dugway. The DOJ-FBI news conference on August 6, 2008 was a deliberate attempt to divert attention from the secret anthrax weaponization projects by pinning the crimes on a dead man. So far the DOJ-FBI have succeeded in covering up the real perpetrators of the crime, concealing the illegal weapons program, and persuading many that it is time to close the investigation. Dr. Ivins was an immunologist; he had neither the knowledge nor the equipment to produce the silica-coated, electro-statically charged, 1.5 to 5 micron sized, one trillion spore per gram anthrax that was mailed to Senators Leahy and Daschle. The DOJ has made much of the fact that Ivins worked 45 extra hours in September and October of 2001. Yet when the FBI attempted to reverse engineer the weaponized anthrax from the attacks, they admitted after a year of trying that they were unable to come up with a product as potent as that in the letters. Ivins passed two polygraph tests and no link was made between his handwriting and that on the anthrax letters. Investigators were so frustrated at Ivins passing the polygraph tests that they searched his house for books or articles on how to fool a polygraph, but found none. Those “additional investigative steps” were polygraph tests. Where passing a polygraph test was enough to exclude certain people, it did not exclude Ivins. Ivins’ car, work locker, safe deposit box and house were thoroughly swabbed for anthrax spores multiple times over the space of years; not a single spore was found, although the killer anthrax was so highly weaponized that it behaved like a gas and was very difficult to contain. None of the materials in the mailings were found at his house: not the tape, the envelopes, nor the pen used to write the letters. There isn’t one piece of evidence placing him in New Jersey at the time the letters were mailed: not a credit card receipt, restaurant receipt, nor a witness. Jeff Taylor’s case against Ivins rests heavily on claims that Ivins was mentally ill. If Ivins was truly so unhinged, why was he allowed to work with toxic substances? His security clearance was never revoked. Certainly a brilliant homicidal serial killer who is determined to avoid detection would immediately get rid of the Ames strain with the incriminating genotype in his flask, if he had used it to make weaponized powder and kill five people. Yet seven years later, the same genotype was still in Ivins’ lab! The DOJ and FBI ask us to believe that Ivins launched the attacks because his vaccine research was not going well and he feared he might lose his job. It’s just not a plausible motivation. In 2003, Ivins received the Decoration for Exceptional Civilian Service-the highest award given to the Defense Department’s civilian employees. He had been a respected scientist at USAMRIID for 35 years and had a very secure job. Ivins had been married for 33 years. He played keyboard at his local church, he was a member of the American Red Cross, an avid juggler and founder of the Frederick Jugglers. He also played keyboards in a Celtic band and would often compose and play songs for coworkers who were moving to new jobs. The FBI focused on him as a probable fall guy in 2006, and for two years was all over him, repeatedly questioning him, searching his home, car and office, and confronting him and his family in public with accusations that he had “killed people.” His daughter was shown pictures of dead anthrax victims and told “your father did this.” His son was promised $2.5 million and a sports car of his choice if he would implicate his father in the anthrax attacks. Who among us would not resort to drink, or drugs, or fantasies of revenge under those circumstances? Who had the expertise to weaponize anthrax? William C. Patrick III, and Ken Alibek. William Patrick was the originator of the first anthrax weaponization process. He has five patents on anthrax weaponization and wrote a paper in 1999 setting out exactly what an anthrax attack by mail would look like. Patrick’s scenario is very similar to what actually happened in 2001. 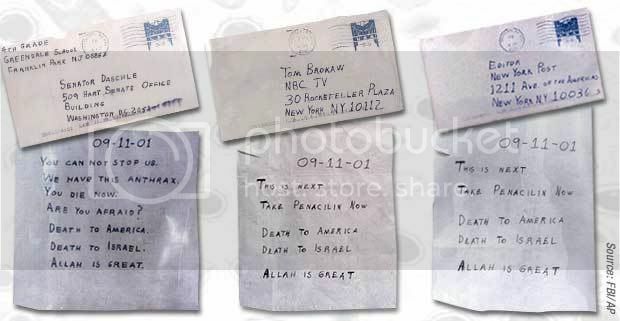 For example, he suggests no more than 2.5 grams of anthrax per envelope; the envelopes contained two grams. One footnote in his paper reveals “we now have the ability to purify to one trillion spores per gram.” William Patrick was a consultant to the CIA, Battelle, the Army, the DIA and the FBI on bio-weapons. Ken Alibek headed up the Soviet bio-weapon programs until defecting to the USA in 1992. He brought with him the technology that was key in the anthrax attacks: using polymerized glass to attach silica to the anthrax spores. He worked for Battelle Memorial Institute in the late 90s. These men had to have been instrumental in developing the technology used in the 2001 anthrax attacks. Who can control the FBI, DOJ and the media? Taylor and his supervisors at DOJ must be hoping that no one will notice or care that they are blatantly lying about their evidence against Ivins. Reading the transcript, it is striking how often Jeff Taylor and Joseph Persichini refuse to answer questions. They either refer reporters to the Department of Defense (which is not holding a news conference) or to the documents they have been given. The evidence I described in my statement, and that I’ve described throughout this question-and-answer period, as I said, led us to conclude that Dr. Ivins is the person who committed this crime. We are confident, based on the evidence we have, that we could prove this case beyond a reasonable doubt. In other words, he doesn’t answer. Honest citizens must ask themselves: who are the FBI and DOJ protecting? Who has the ability to control and corrupt an investigation of this importance? And why, after sitting through a news conference that is obviously a hastily constructed web of lies, have so many journalists dutifully reported the story just as instructed by Jeff Taylor? We no longer have a working government in the United States. What we have are functionaries in various departments-Congress, FBI, DOJ, CIA-who take their orders from the corporations who make vast sums of money waging war and selling vaccines. Their influence extends to the major media outlets who control the flow of information to the American people. We are increasingly enslaved, manipulated and murdered by these corporations, and very few of us seem to realize it. Sheila Casey is a DC based journalist. Her work has appeared in The Denver Post, Buzz Flash, Common Dreams and Dissident Voice. She blogs at http://www.sheilacasey.com Barry Kissin is an attorney/peace activist based in Frederick, MD, home of Fort Detrick. Alex Jones talks with Francis A. Boyle, professor of international law at the University of Illinois College of Law and bioweapons advisor for the Bush Senior administration about his belief the anthrax attacks were a false flag operation. AJFan on Fri, 08/29/2008 - 7:08pm. The Senate Committee on the Judiciary has scheduled a hearing on “Oversight of the Federal Bureau of Investigation” for Wednesday, September 17, 2008 at 9:30 a.m. in Room 216 of the Senate Hart Office Building. Salon Magazine's Glenn Greenwald interviewed FBI critic Sen. Charles Grassley (R-Iowa) on August 20. This has been a long investigation, full of missteps and mistakes. There's been too much secrecy up to this point, and it deserves a full and thorough vetting. There are clearly a lot of unanswered questions, and it's time to start a dialog so we get answers. And you then listed 18 questions that you have about the investigation, the last one of which was, quote: "What additional documents will be released, if any, and when will they be released?" Now, first of all, have you received a response from either the Justice Department or the FBI to that letter? "CG: No, and I assume one of the reasons I haven't is because in the meantime, the FBI has consented to a hearing that Senator Leahy's having, and a hearing is one instrument of doing it. At the time I wrote the letter, I didn't know whether there'd be a hearing or not, and I wanted to make sure, as one individual senator who's not chairman of the Judiciary Committee, that I would do my own oversight and get answers to questions. It could be that the forum for answering my letter would be the hearing, but I want to make sure my 18 questions are answered one way or the other, and I want to ensure that every document's out." Please contact Sen. Leahy and others on the Judiciary Committee with your own questions and comments. Anthrax could be the back door to break the 9/11 lie wide open. USAPatriot on Fri, 08/29/2008 - 7:30pm. USAPatriot, I agree, "Anthrax could be the back door to break the 9/11 lie wide open. " That's why we decided that the Anthrax had to be the lead story for the September issue. Sheila Casey did a great job of bringing all the various pieces of the story together with the help of Barry Kissin who is a Fredrick MD resident and has been following the bioweapons issue for many years. Next month in the creek we will have a follow-up article by Barbara Honneger that points out even more connections between the 9/11 perpetrators and the anthrax attacks. Matt on Sat, 08/30/2008 - 10:32am. AJFan on Sat, 08/30/2008 - 9:04pm. (Sigh...) I'd like to believe some good could come out of these hearings, and I can give the benefit of a doubt to a few of the members (Leahy, Grassley, Feingold), and to those whose names I'm not really familiar with; but then I see other names that I just can't imagine ever allowing anything but limited-hangout coverup: Spector (!--magic bullet--need I say more? ), Hatch (partisan Republican from Utah, same state as Dugway), Biden, Feinstein, Schumer (unremitting hawks, who would do anything to divert attention away from false-flag capabilities). rm on Mon, 09/01/2008 - 12:35am. By way of Sheila - Terrific column in the Frederick News-Post today about the flimsiness of the govt case against Ivins. Please email Katherine Heerbrandt thanking her for naming the "elephant on the grassy knoll." Note that contractor Battelle, who received this contract for $750 million, is a tax-exempt organization. No doubt they are involved in many humanitarian projects, right? When Norm Covert, a conservative former Fort Detrick public affairs officer, and attorney Barry Kissin, liberal activist opposing Detrick's biolab expansion, agree that Bruce Ivins was not the anthrax killer, either the world's spinning off its axis, or the truth is staring us so hard in the face we'd have to be blind to miss it. In a recent letter to the FNP editor, Amanda Lane speaks for many who knew him: "I want to shout from the mountain tops that Bruce was the kind of man we look up to ... He was a decorated scientist and the humblest of men who didn't use his title as a status symbol. He picked up a mop or emptied the trash without a moment's hesitation. If he thought you were having a bad day he would offer candy or a catchy tune to cheer you up. If someone had to stay late to accomplish a task, Bruce would work with you so that the task would get completed faster." Covert echoes what is widely reported by reputable scientists. The anthrax in the mailings, he says, was "highly bred, weapons-grade ... with a silica coating and a slight electrical charge so that each particle repelled the other ... each particle no more than five microns." Ivins had neither the expertise nor the equipment to create such a sophisticated form of anthrax. But if not Ivins, then who or what? "It's the elephant in the room nobody's talking about," Kissin says. Since Nixon terminated the offensive weapons program at Detrick in 1969, there has been only one corporation in our country that operates laboratories where anthrax is weaponized: Battelle Memorial Laboratories, the corporation that does the biolab work for the Central Intelligence Agency, the Defense Intelligence Agency, and the Army at Dugway Proving Ground in Utah. In December 2001, FBI Director Mueller announced that the Battelle-operated labs in West Jefferson, Ohio and at Dugway had been "searched," and that there were NO suspects in those labs. The FBI has not mentioned Battelle since. New York Times science writer William Broad covered the subject in his 2002 book "Germs, Biological Weapons and America's Secret War." According to Broad, Projects Jefferson and Clear Vision, begun in the late '90s were ongoing secret anthrax weaponization projects. Project Clear Vision was managed by the CIA at the Battelle labs in West Jefferson, Ohio. Project Jefferson was managed by the DIA at the Battelle-operated labs at Dugway. Kissin and writer Sheila Casey thread this information together in a recently published article in the Rock Creek Free Press, http://www.rockcreekfreepress.com/CreekV2No9-Web.pdf, to conclude that the case against Ivins is nothing but a flimsy cover-up of the secret workings of these anthrax weaponization projects. How do Americans even begin to confront the reality that the only bioattack in our history came from an American military/intelligence lab? An attack we were told made the massive expansion of biolabs at Detrick and across the country necessary. And guess who's been hired for $750 million to manage and operate the first new biolab facilities at Detrick that are about to open? Pixelwrangler on Sat, 08/30/2008 - 12:27am. link2zelda on Sun, 08/31/2008 - 12:55pm.